On the surface, LetterSchool may look like just a beautifully crafted handwriting game with a lot of flash and fun, but there’s a lot more to it. We’ll try to explain some of that here. Learning how to write is a tremendous challenge for young children. They must visualize and reproduce a huge number of complex letter trajectories and memorize dozens of related phonics. Letter sounds must be associated with words and numbers with values. LetterSchool ensures that kids absorb all this knowledge as they develop the fine motor skills they need. This optimal preparation for handwriting gives them a head start upon entering school. Completing the silver level (blue menu) is a massive achievement by itself, but for best results, children should practice all the letters again after a while. This is where the gold level (orange menu) comes in, repeating the same four steps with a whole new set of games and a greater challenge. This extensive practice in two distinct levels ensures the child’s knowledge of letters and numbers will take permanent root. LetterSchool does its very best to present every letter at maximum scale, regardless of device orientation. This helps toddlers learn and memorize the letter shapes. This solid letter knowledge, the basis of legible handwriting, forms the foundation of a child’s literacy. Achievements are rewarded with amazing special effects and every successfully written letter or number is recorded with a star in the menu screen. A complete set of stars provides access to the gold level, unlocking a whole new set of games. All this keeps kids motivated for a surprisingly long time. Tip: Play taller letters in portrait orientation, wider letters in landscape. LetterSchool’s simple, consistent method guides the young player with strong clues that work for all children, regardless of their learning styles. LetterSchool is also ideal for children who reverse letters or numbers and children with special needs. LetterSchool does everything possible to simplify the learning process. Visual instructions are easier to process for a young child’s brain than verbal instructions. Research indicates that verbal instruction would be counterproductive, as they place an extra load on the working memory. That’s why LetterSchool makes exclusive use of visual information to demonstrate letters. As you know, the things you discover all by yourself stick with you the longest. LetterSchool guides kids by providing subtle yet highly effective visual and auditory feedback when it intelligently detects that they need a hand. That way, young players are completely free to explore the mysterious world of letters, acquiring letter and number fluency in their own, intuitive way. It’s crucial that kids learn correct letter shapes before having to worry about fitting them between lines. First all their attention must be focused on the letter shape and trajectory. This approach leads to fluent movements and, most importantly, to growing self-esteem. Writing words between lines is the next step, and we will offer it in future apps. Be sure to leave your email address in the stay informed box at the bottom of this page if you’re interested. 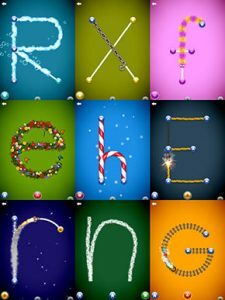 LetterSchool contains the kind of stunning graphics, exciting particle effects, sleek animations and engaging sound effects not easily found in educational apps for this age group. These ingredients guarantee young children an exceptional and lasting gaming experience. The impressive free-form writing enhances the thrill, allowing players to write their very own letters. In order to make LetterSchool a rock-solid piece of software, we didn’t just rely on our own experience in education and game development— little experts tested it fanatically, leaving no stone unturned. Thanks guys!